The unemployment rate dropped today from 7.6% to 7.5% after 37,000 Americans left the US workforce. The unemployment rate dropped because the civilian labor force declined. So much for the trends of beats: July nonfarm payrolls +162K missing expectations of 185K; June was revised lower to 188K and the unemployment rate dips from 7.5% to 7.4% . 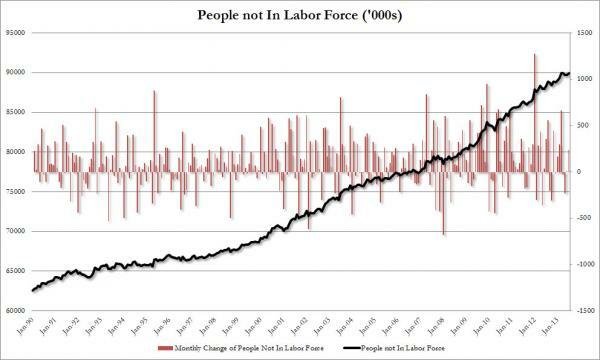 The rate dropped because the civilian labor force declined from 155,835 to 155,798 or 37K, driven by an increase of people not in labor force to 89,957 – just shy of the all time high. This also means that the labor force participation rate once again ticked down to 63.4% from 63.5% .